26 Mar How does NFC work? Near Field Communication or NFC allows short-range communication between devices. Different devices that use the NFC standard will be considered active or passive. Active devices can send and receive information as well as communicate with one another. It can also communicate with passive devices. Some of the most common types of active NFC devices are smartphones, touch payment terminals and public transport card reader. Passive NFC devices, on the other hand, are capable of sending data to another NFC device even without using a source of power. Examples of such devices are small transmitters and tags. A passive NFC device can’t connect to other passive devices and don’t process any data sent from other sources. Examples of such devices include interactive signs on ads or walls. NFC sends data over radio waves. The technology utilized in Near Field Communication is based on an older RFID idea that used electromagnetic induction to transmit data. This is one of the factors that differentiate NFC from Wi-Fi and Bluetooth. NFC devices should follow certain specification to communicate with one another properly. Electric currents can be induced within a passive component and data can be sent by using NFC devices. Passive NFC devices don’t need a power supply. They can be run by the electromagnetic field generated by active NFC components. NFC technology, however, doesn’t provide sufficient inductance to charge smartphones. Electromagnetic fields can be used to induce electrical currents in receiving devices or transmitting data. Although passive NFC devices get power from the fields generated by active devices, the range is quite short. Data can be delivered at 424, 106 or 212 Kbps, which is fast enough for data transfers. The NFC standard has three different operation modes that determine the kind of data, which will be exchanged between devices. The peer-to-peer mode is the most common, and it allows 2 devices that are NFC-enabled to exchange information. Both devices shift between passive when receiving data and active when sending. Card emulation is another mode. The NFC device can work as a contactless or smart credit card and tap into a public transport system or make payment. Read/write mode is a one-way transmission of data. The active device connects another device to read data from it. An NFC advert tag makes use of this mode. Here’s an example of how NFC works. When you activate an NFC-reading application on your smartphone, the app sends a signal to the NFC chip within the phone. Electricity flows through the chip circuitry, producing a weak magnetic field. Your phone becomes an active NFC device. The magnetic field from the phone induces a magnetic field in an NFC tag, which induces electricity in the tag and creates a radio field. The NFC chip in the phone decodes the radio field. 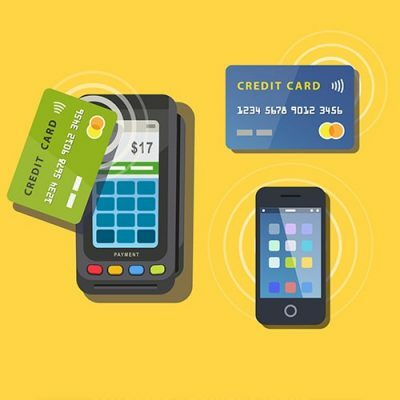 Some NFC transactions involve 2 powered devices. Both devices work as passive and active components. It takes a moment for the devices to send data to each other. NFC doesn’t determine the content of the transmissions. It only covers the actual transmission technology. The apps and hardware that incorporate NFC chips will dictate the type of information changes. NFC consumes less power than Bluetooth, makes it ideal for passive devices like advertising tags as it can work without a power source. However, it has some drawbacks as well. NFC has a shorter range of transmission than Bluetooth. The latter can transmit information up to 10m or more while NFC has a range of about 10 cm. NFC is a little slower than Bluetooth, sending information at a speed of 424 kbit per second. Bluetooth 2.1 transmits data at around 2.1 Mbit per second. NFC, however, has faster connectivity as it uses inductive coupling. There’s no manual pairing involved. Connecting two devices takes less than 1/10th of a second. NFC is convenient for some situations such as mobile payments. Users can pay through their tablets and smartphones using their mobile wallet. It’s easy to use and understand as it allows users to conduct financial transactions at the simple tap or touch of their screen. NFC is also more secure than using physical credit cards. In case the user’s mobile device is stolen or lost, his card information is PIN and password protected. This adds another level of security and gives users peace of mind. NFC-enabled payment cards are more secure than a regular credit card’s magnetic strip. Retailers wouldn’t have physical access to the credit card information of customers. NFC providers better user experience, which is beneficial for businesses as companies that adopt the latest technology are seen as being progressive and dynamic. Businesses can improve their efficiency and productivity, allowing them to attract new customers and maintain customer loyalty. It also allows them to serve customers better by giving them a hassle-free and quick payment mode. NFC is also versatile as it covers various services and industries. It can be used for reserving movie passes, restaurant seats, mobile banking, redeeming coupons and rewards and getting a real-time update on reward points and expenditure Employees can use NFC to share real-time information. NFC’s high encryption also allows educational institutions to use it as some security system that conducts a proper ID check on students exiting or entering the premises. However, HFC has some disadvantages as well. One of these is that it’s expensive. It may be too costly for companies to buy and maintain equipment related to NFC-enabled technology. Large companies have successfully assimilated NFC-enabled technology in their operations, but smaller businesses may find it hard to increase profits and sustain their current turnover. Hiring technicians to install and maintain software and hardware could result in more expenses. NFC transactions are safer than regular credit card payments, but it’s not entirely free from all kinds of risk. Continuous developments in technology come with various consequences. People with ill intentions are always looking for ways to gain unauthorized access to users’ financial, social security and personal data, making the whole system vulnerable. The lack of security could discourage businesses and users from fully accepting this technology.